Own a Four-wheel drive and want a scenic weekend getaway? Then you might like to organise your next camping trip to the beaches of Northern Cooloola. The Cooloola coastline is just under three hours drive from Brisbane City and is is part of the Great Sandy National Park. 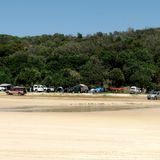 A less-known slice of beach and bush, Northern Cooloola is tucked in between the popular Fraser Island and Noosa Heads. The Cooloola beaches are some of the only shores in Australia open for 4WDing. Once you've travelled to the Sunshine Coast, the Cooloola beaches are accessible via a vehicle barge at Elanda Point. From here the beach is your highway. Daytrips are common, however camping is available for more lengthy visits. The Freshwater site is a shady campground roughly 500 metres off the beach and has the essentials: toilets, showers (bring $1 coins for hot water), a payphone, BBQ's, bins and taps. For the more serious camper, there are 15kms of coast designated for beach camping. Camping is priced at approximately $5.00 per person, per night and should be booked in advance. For more information and bookings see the Northern Cooloola information page. There is a range of activities to enjoy during your stay. The two main beaches and surf breaks are at Double Island Point and Paradise Beach. Both breaks are fairly protected and perfect for swimmers. Fishing is permitted anywhere along the beach and there are few popular spots for snorkeling around the points. There are eleven walking tracks in Northern Cooloola that range from 5-minute circuits to 3-day hiking trails. Further information about activities at Cooloola can be found on the national park activity page. Make sure to visit the Bureau of Metrology page to check the tide charts before you depart. For 4WDing tips and information visit the Driving On Sand page. Why? Experience one the state's most beautiful national parks. Where: Northern Cooloola, The Great Sandy National Park. Cost: Free National Park entry. Camping is $5.00 per night per person. Vehicle Barge $6.00.